Spin motion and huge sunshine into your garden with our impressive new 88" Kinetic Sun Wind Spinner garden stake design! An early release for 2017 we just could not wait to get this one up on the site! 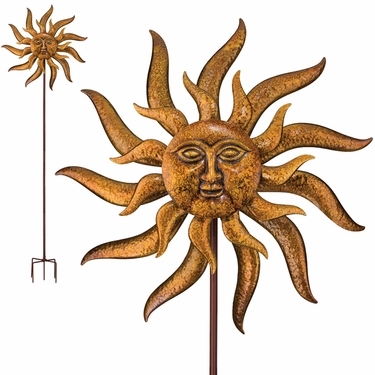 This huge Sun Face Decor garden stake design features a gorgeous metal finished sun with large, durable ball bearings, thick, super-strong iron casings to keep blades attached, strong ground stakes and poles. An exciting way to capture the wind and bring kinetic motion into your sun worshiping paradise are year long. Heavy duty quality bearings for smooth twirling action. Sun Rays provide motion to any garden.